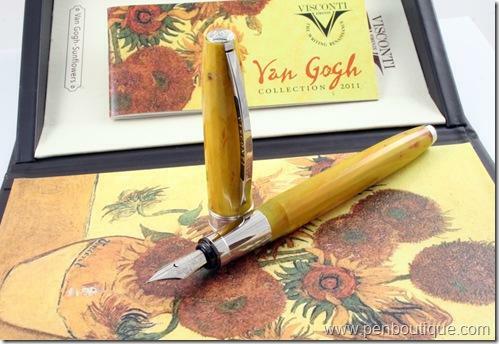 Visconti Van Gogh collection features a multicolored resin surface 16 faccette.Sei are the works of the famous Dutch painter of which are inspired by the colors of the feathers: The Starry Night, The room of Harles, the self-portrait, the Sunflowers, Willows and Iris. 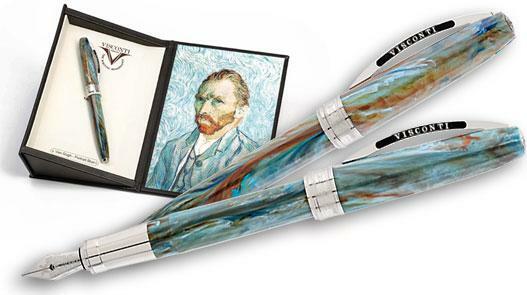 The case reproducing the painting creates a harmonious glance with the pen. The nib is steel available in sizes medium, fine, and off loading is cartridge / converter. Possibility of personalizzazioe by appending initials with My pen System of Visconti. 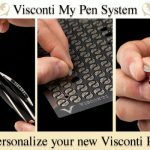 The famous system, patented by Visconti to personalize each pen of their collections by the application of magnetic initials on the top cap of all the Visconti pens!! Quick,smart and sober !! 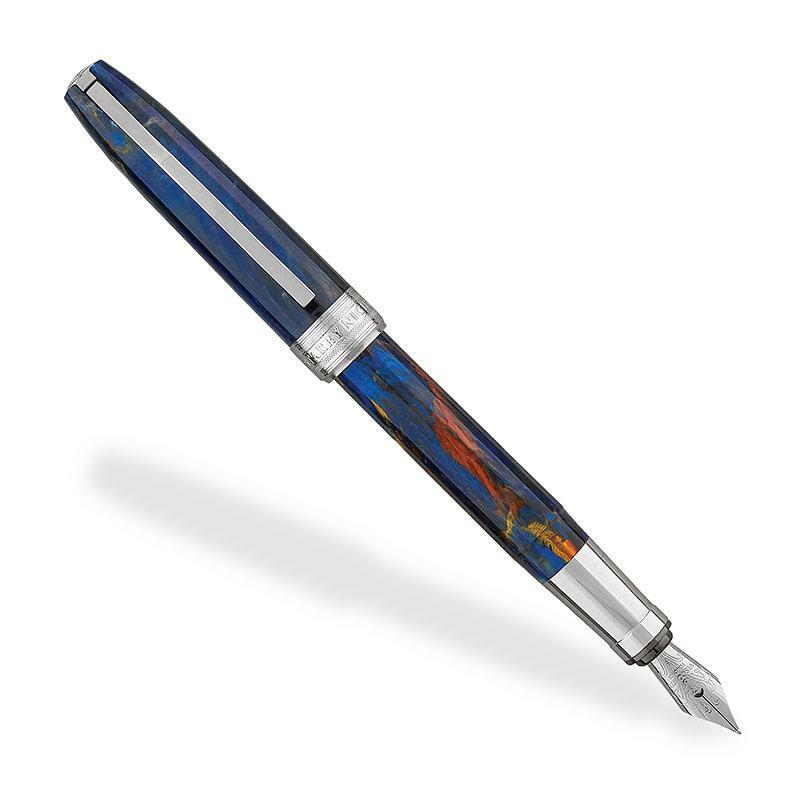 Visconti welcomes the Divina Elegance, a new evolution of its timeless Divina series. An extension of the Divine Proportion limited edition, the new Divina Elegance has the same spiral shaped body and perfect proportion based on the golden number of 1.618, the ideal aesthetic ratio in Western art and science. 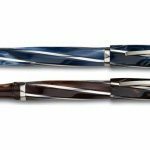 Visconti has added an element of color in swirling pearlescent blue and brown resins to enhance the appearance of the classic Divina shape. 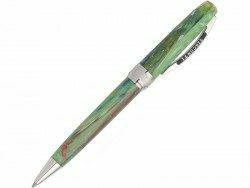 With its signature silver rods that spiral around the pen, the Divina Elegance is an iconic Visconti design that offers luxury, functionality and a great feel in the hand. 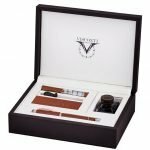 The fountain pen and rollerball are available in large or medium sizes: both fountain pens feature Visconti*s superbly flexible 23kt palladium nib and unique Pull & Turn filling system. An innovative hook safe locking cap system aligns the pen and cap securely. The medium twist ball pen completes the Divina Elegance series. Bottle fill only. 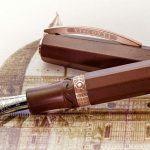 We named the pen Brunelleschi, in homage to the great architect and the dome of the cathedral as thelargest artifact in the world made of Florentine Cotto. items discovered by archaeologists in Egypt, Syria and Mesopotamia. But then, it's a really simpleprocess. You mix earth and water together, kneading and moulding them into a malleable mass, whichyou then shape into the required pieces, and allow fire to finish the job for you by turning them solid. pottery, statuettes, vases and so forth. It was from Etruria that terracotta was introduced to Rome,being used by the building industry in the imperial capital chiefly to manufacture bricks and tiles. So the production of terracotta artefacts in the Florence area is likely to date back to the Roman era,although there is little documentary evidence for this, and the first Tuscan Terracotta Artistan Guildsare only recorded in around 1400. Earth, water, air and fire. The first phase of the process in the manufacture of artefacts in terracotta involved finding the clay andgetting it to the kiln. Once there, it was given an initial cleansing with water to rid it of alien organic substances, after which it was filtered through a series of sieves. Once the artefacts had been modelledby hand using moulds, they were set out to dry in the courtyard by the kiln before firing. The firing process itself was a fully-fledged ritual with its formulas and its incantations in the old wood kilns. roughly 45 grs, it falls perfectly within the virtually universal weight range, being neither too light nor too heavy – in fact, it's the perfect weight for daily use. Its shape, like that of our Homo Sapiens pen, is based on Leonardo's Divine Proportion, which makes the size of the cap 0.618 of the size of the barrel. 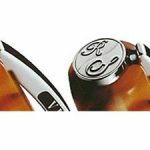 The pen's lock system, a Visconti patent, is the well-known Hook Safe Lock method that allows the user to close the pen by rotating it by only 20°, thus making it absolutely impossible to open the cap by accident. First of all the colour, the brick colour is dark enough to have become a colour in its own right: the word "cotto" is traditionally used in Florence to define this specific terracotta hue! legendary Parker Big Red or the early Waterman. Unlike ebonite, however, the terracotta compound is extremely stable, it does not dull with age and it is considerably more shock-resistant, although admittedly without the outstanding resilience of the Homo Sapiens lava.